To turn the phone on, press the Power button. The phone turns itself on. You see the Droid X logo and animation, and the phone may scream “Droid” at you. To turn the phone off, press and hold the Power button. 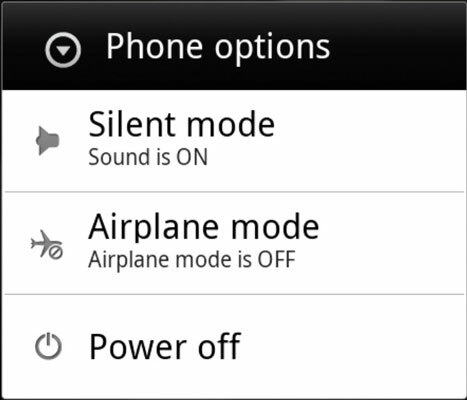 If you change your mind and don’t want to shut down the phone, press the Back soft button to cancel. If you don’t press the Back button, eventually, you see the Phone Options menu. Touch the Power Off item; then touch the OK button to confirm. Off goes the phone, crying out “Droid” when it goes. The phone doesn’t receive calls when it’s turned off. Those calls go instead to voice mail: either the voice mail you set up with your cellular service or your Droid’s Visual Voicemail.